Attestation of the Marriage Certificate is required for getting a Family visa in the Middle Eastern Countries like UAE, Saudi, Kuwait, Oman, Qatar and Bahrain. Similarly, Marriage Certificate Attestation for UAE is a vital legal process to get family visa in UAE. A Marriage Certificate is a document which legalizes the marriage between couples. It is an official record/proof that the marriage has taken place. Marriage Certificate Attestation in UAE is the act of witnessing a Marriage Certificate by authorized persons or Departments or authority with their authorized seal and signature. Marriage Certificate Attestation is needed by the government of the UAE mainly for the purposes of spousal sponsorship. This Attestation also confirms that, the specific Marriage Certificate has been issued by that particular department and Seal and signature on that particular Marriage Certificate is genuine. We at SEPL Document Clearing LLC offer complete range of marriage certificates Attestation/Apostille services for UK, USA, India, Australia, Canada and many other country marriage certificates. Our Marriage Certificate attestation/Apostille process does not require your presence and you don’t have to fritter away your time as we will take care of all process. 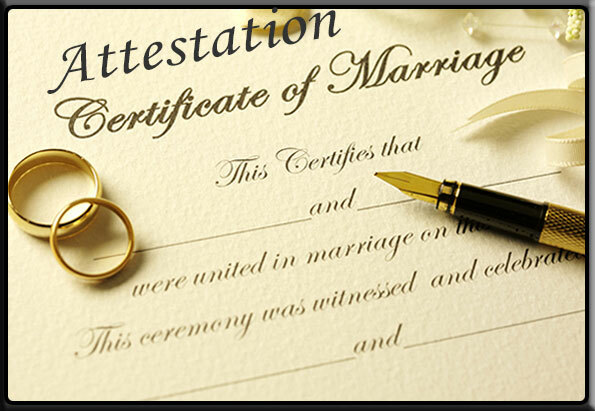 SEPL Document Clearing LLC is a leading company for Marriage Certificate Attestation in Dubai. In UAE, there is a minimum salary requirement of AED4000 to get the family visa. Indian Marriage Certificate Attestation can be done from the issued country of the certificate that is India. For using the certificate in UAE, certificate should be attested from respective Home department, MEA & UAE Embassy located in the country India. We attest all kind of certificates, documents, degrees from different State HRD Departments, Ministry of External Affairs, SDM, GAD, Notary, Mantralaya and different Embassies like UAE, Saudi Arabia, Kuwait, Qatar, Oman and Bahrain, etc. It is advisable to have a legal translation of the Marriage Certificate from the language of your native country into both Arabic and English. For example, if the marriage were solemnized in India, then the marriage certificate would first have to be attested in India by the concerned Stateâ€™s Home Department, followed by the Ministry of External Affairs, New Delhi. Now if the family visa is being applied for in UAE; the attested document from the MEA would be attested by the UAE Embassy in New Delhi and finally by the Ministry of Foreign Affairs in UAE. The procedure is the same for all the countries in the Middle East. The act of witnessing the signing of a document and then also signing it to verify that it was properly signed by those bound by its contents. Make sure your Attorney / Solicitor signs your document in their own personal signature (not a company signature/ stamp).